A few weeks ago I went to an event in Manchester called the Midsummer Meet and we were kindly given a good bag, I have uploaded a video to my You Tube channel showing all the products that were in the goody bag, if you would like to see that video click here. 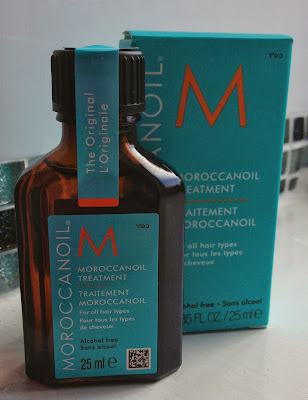 There were lots of fantastic products in the goody bag, one of the products was a 25ml bottle of Moroccan Oil, I was really pleased to see the Moroccan Oil in the bag as it is something I have wanted to try for a while but since I have plenty of my Wella Sp Luxe Oil (see review in this post) left I have been waiting to use that up before purchasing the Moroccan Oil. At the event Moroccan Oil had a stand and I spent a few minutes chatting to a gentleman about their products and he gave me a consultation advising me on what products to buy from their range and how to use them, he spoke about the Moroccan Oil and said the best way to use it was to run a small amount through towel dried hair and style as normal. I am prone to having oily hair so when I applied the Moroccan Oil I applied a tiny bit and only applied it to the ends of my hair, and styled as normal. The amount of Moroccan Oil I used. The product smells lovely and a little bit goes a long way, I have long hair and the amount in the photograph about was fine for me to use through the ends of my hair. My hair felt really soft and smelled amazing after using the Moroccan Oil but unfortunately by the evening my hair was greasy, I was so disappointed as I really wanted the product to be amazing, I have read so many blog posts all claiming this to be a wonder product but not for me, I decided to ask Alicia and Nichole to test out the Moroccan oil too, Alicia has the same sort of hair as me, fine but a lot of it and prone to oiliness but Nichole's hair is very dry due to having it bleached. Both Nichole and Alicia found the same results as I had, their hair was left greasy too by the evening of the day the used it. I am so disappointed that the Moroccan Oil didn't work out for me, it smells lovely and my hair felt really soft at first but then went lank and eventually greasy. I will be sticking to my Wella SP Luxe oil from now on. Like I said I have read so many reviews on this product on lots and lots of blogs and they all loved the product so I think it must depend on your hair type, but unfortunately it didn't work for me at all or Nichole and Alicia. If you love Moroccan Oil or want to try it for yourself it is available from Look Fantastic, Feel Unique and Amazon in a wide range of sizes, and if you would like the 25ml bottle it is available here and here. 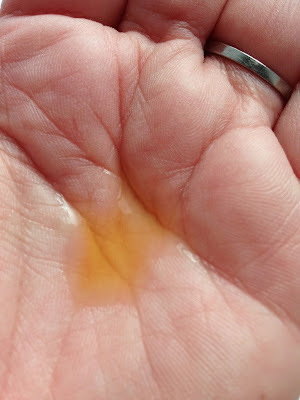 Have you tried Moroccan Oil? Did you love it or hate it?